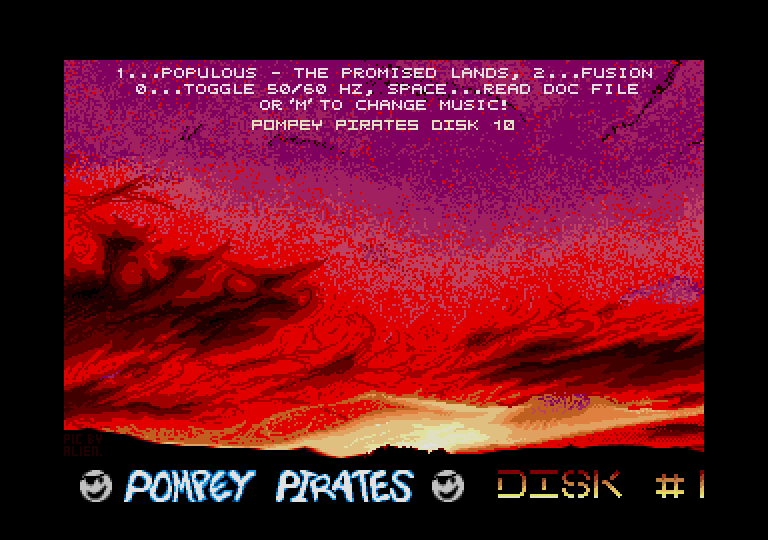 A beautiful skyline picture brings us Pompey Pirates CD #010. € DISK #10! WELL, WAS THE PC SHOW BORING OR WAS THE PC SHOW BORING??! NOTHING BUT LOADS OF CHEAP DISKS AND STUFF- THE ONLY NEW RELEASE WORTH MENTIONING WAS STUNT CAR RACER, AND THAT I CAN WAIT FOR! NO STE!! NO TT!!! ATARI, WHAT'S HAPPENING?? A BIG HELLO TO THE GIRLS ON THE ST ACTION STAND- YOU'VE CONVINCED ME, I'LL BUY ST WORLD FROM NOW ON! TO THE REPS ON DOMARK'S STAND... SORRY IF I OFFENDED YOU TOO MUCH, BUT EVEN YOU HAVE TO ADMIT THAT HARD DRIVING ISN'T EXACTLY MEGA FAST... 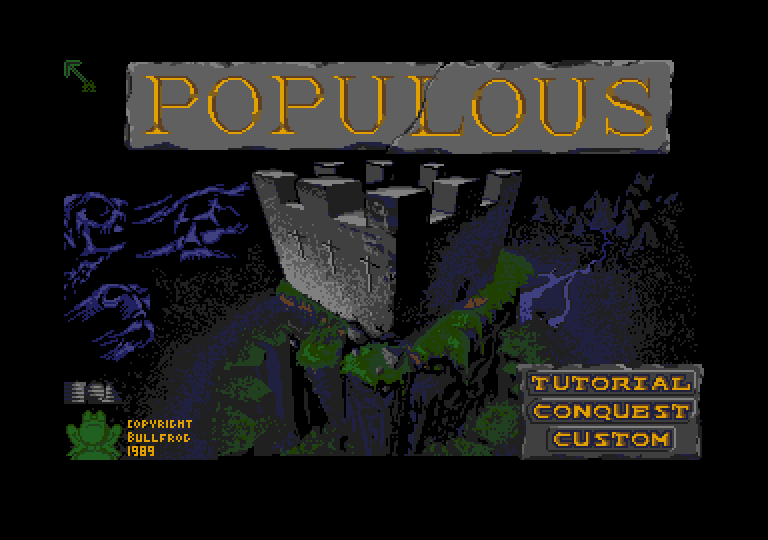 TRY WRITING IT IN PURE 68000! BOMBER NOT OUT UNTIL 27TH OCTOBER?? AAARRGGHHH...! THANKS TO  COLIN K. FOR STARTING OFF THIS FONT... PIC BY „…†‡ˆ‰Š‹Œ! FUSION MIGHT BE A LITTLE CRUMBLY IN THIS DAY AND AGE, BUT IT DOESN'T SEEM TO BE AROUND ANYWHERE ELSE, SO HERE IT IS! WITH POPULOUS, THE EXTRA WORLDS ARE LOADED AUTOMATICALLY- THE PASSCODES FOR EACH LEVEL ARE THE SAME AS ALWAYS, BUT THE LEVELS WILL LOOK DIFFERENT AND BE MORE DIFFICULT. TO PLAY THE OLD LEVELS, YOU'LL HAVE TO USE THE CUSTOM GAME. THANKS TO STUD FOR THE ORIGINAL! WOULD ANYONE LIKE DESKTOP MUSIC PROGRAMS? 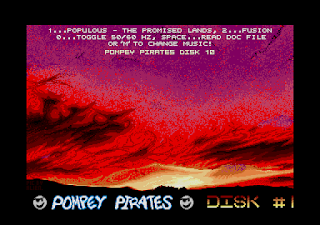 ALL THE TUNES FROM OUR MENUS AND AS MANY AS POSSIBLE FROM GAMES- AS CLICKABLE .PRG FILES YOU CAN RUN FROM THE DESKTOP TO MAKE LIFE LESS BORING WHEN NOT PLAYING GAMES... AS AN EXAMPLE, ON THIS DISK IS MEGABLST.PRG... RUN IT AND HAVE MEGABLAST RUNNING CONTINUOUSLY! IF ENOUGH PEOPLE GET BACK TO US AND SAY THEY LIKE THE IDEA, I'LL START DOING MORE! POMPEY PIRATES CORE MEMBERS... „…†‡ˆ‰Š‹Œ, DES, IAN H., STEVE R., RICHARD III, LAWZ. FRIENDS OF POMPEY PIRATES... MARK L., DAVE C., VINO, ANDY, COLIN K. AND MICKEY MUTANTS. TOTALLY OVER THE TOP INTERGALACTIC MEGA NUCLEAR POWERED GREETINGS TO... DEREK M.D. AND ZARNIWOOP (STEVE SAYS THANKS FOR THE PC SOFTWARE) GREETINGS AND FELICITATIONS TO... PAUL, PHIL, DREAM WEAVERS, JOHN H., IAN C., JOHN PANIC, A.L.F. AND THE REST OF THE BOYS (ANY GIRLS?) AT THE CLUB (YES, WE ARE OPEN TO SUGGESTIONS), MEDWAY BOYS, AUTOMATION, MCA, WINNY AND THE GUARDIANS OF LOGIK, THE UNION AND ALL OTHER GROUPS... APOLOGIES FOR THE NON WORKING 50/60 HZ TOGGLE ON ONE OF THE PAST SCROLLERS... FUNNY THOUGH, WASN'T IT? GOT A MODEM? TRY THE MAX BBS ON THESE NUMBERS... ALL PREFIXED WITH 0905... -52536- -56610- -57822- -58030- -754127- -754151- (THERE'S ACTUALLY TEN LINES, BUT THE OTHER 4 ARE FOR REGISTERED USERS) POMPEY PIRATES WANTS YOU! IF YOU CAN CRACK, DRAW, WRITE MUSIC OR SUPPLY NEW SOFTWARE QUICKLY, RELIABLY AND UNCRACKED! !, GET IN CONTACT WITH US! JUST ASK WHOEVER GAVE YOU THIS DISK TO PASS YOUR NAME AND ADDRESS ON TO US... IF YOU'RE PERSISTENT YOU'LL GET TO US. PLEASE DON'T BOTHER IF YOU'RE WELL OUTSIDE HAMPSHIRE, AND IF YOU'RE VERY FAR FROM PORTSMOUTH, YOU'LL NEED TRANSPORT THERE EVERY OTHER WEEK... SLAGGING OFF TIME... A CERTAIN COMPANY (OH, ALRIGHT IT'S P.M.S.) HAS PRODUCED A VIRUS TO SAFEGUARD AGAINST PIRACY... NICE ONE GUYS. SEEING AS WE ARE JUST ABOUT THE MOST MANICALLY PARANOID ABOUT VIRUSES, MOST PIRATES KILL ANYTHING SUSPICIOUS IF IT'S ON ANY NEW STUFF. SO, IT WON'T AFFECT US, AND MIGHT GET ONTO PD SOFTWARE, IN WHICH CASE IT SCREWS UP DISKS BELONGING TO PEOPLE WHO NEVER PIRATED YOUR JUNK. GREAT THINKING. I LEAVE THE EXPLETIVES TO THE READER'S IMAGINATION!